OXFORD, Miss. 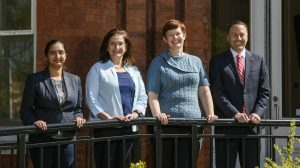 – Three University of Mississippi professors were honored Friday (May 11) by the College of Liberal Arts for their excellence in teaching. The other two honorees are Irene Kaufmann, lecturer of Spanish, who received the Outstanding Instructor of the Year Award; and Molly Pasco-Pranger, chair and associate professor of classics, who was presented the Cora Lee Graham Award for Outstanding Teaching of Freshmen. All three honorees will be recognized during Commencement exercises Saturday (May 12) in The Pavilion at Ole Miss. Donald L. Dyer, associate dean of faculty and academic affairs for the College of Liberal Arts, praised the exceptional teaching provided by the faculty members. Each of the recipients expressed gratitude for their recognition. Pasco-Pranger said she is “deeply touched and humbled” to have been singled out for this award among the college’s excellent teaching faculty. Recipients also shared their philosophies of teaching. “Teaching a language is my instrument to help students open their minds to a wider world,” Kaufmann said. “Through learning a new language, students become more curious and respectful of other cultures. Pasco-Pranger said she loves helping students in their own process of discovery, whether it’s finding a new body of knowledge, or their own interests and talents, or new ways to think about the world around them. Nomination letters noted why each recipient deserved her award.